Bring the whole family for a fun evening of music, film and a chance to meet pro kayaker Steve Fisher for the debut of Fisher’s film “Halo Effect” in Ketchum at the nexStage Theatre on Thursday, June 16, from 7:30-11 p.m. Tickets are $15 at the door. The evening of events will feature the full-length, award-winning adventure film with an opening musical performance from The Shook Twins, a Portland, Ore.,-based female folk singing duo originally from Sandpoint, Idaho. In addition, Fisher will premier a new short film, still untitled, which is the first-ever kayak production shot with 3D technology. The Shook Twins’ new song, “Time to Swim,” is the featured song in the video. “Halo Effect” is an adventure-travel/kayaking film featuring three of the world’s best kayakers on a two-month journey to Iceland and Norway to explore the Arctic Circle for rapids and waterfalls that have never been run. Exquisite cinematography, big water and a dramatic symphony soundtrack separate this film from typical action-sports video. 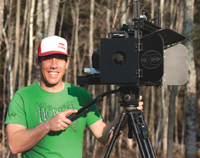 Fisher is a professional whitewater kayaker and cinematographer who began chasing big water at the age of 21 when he moved from his home in Durban, South Africa, to the wild waters of Africa’s famed ZambeziRiver to kayak full-time. He’s been traveling the world nonstop ever since, often visiting more than a dozen countries a year. When not aboard his motor home in search of water and great shots, Fisher can be found living on his island residence in the middle of the White Nile in Uganda, using an inflatable motorboat to access his favorite play spots.